EFBE TRI-TEST. The ultimate reference test. 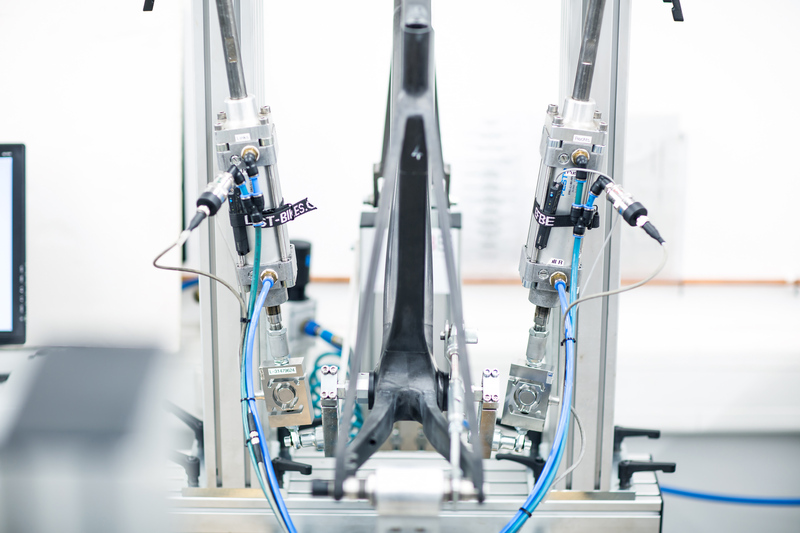 The TRI-TEST® is EFBE’s proprietary development, which goes way beyond the established national and international standards and reflects the specific challenges faced by modern bikes. 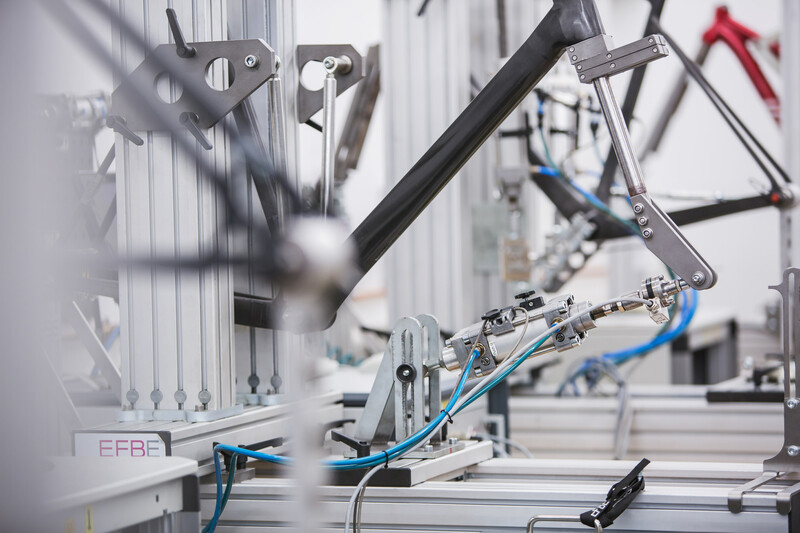 With its three modules – fatigue tests, maximum load tests and overload tests – in various load cases, it provides a time-lapse simulation of the stresses throughout a bike’s entire life. 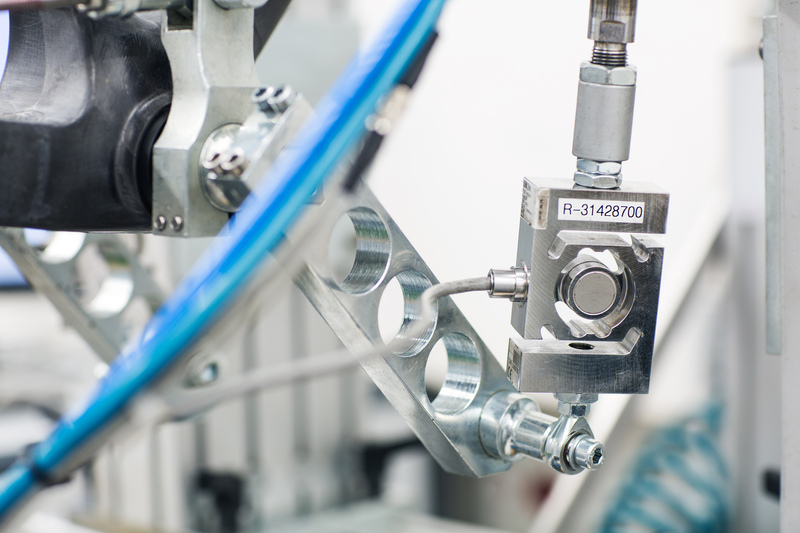 A frame, for example, has to undergo up to eight individual test stages before it can be awarded the EFBE TRI-TEST® seal. Product development in the industry outpaces the development of new standards. In the e-bike market, new products emerge which have little similarities with EN 15194 from 2017; modern high-end sports bikes diversify to a degree of specialisation that the existing standards provide very few answers for. ISO 4210 only knows one type of MTB, and EN 15194 recognises no more than one type of EPAC. 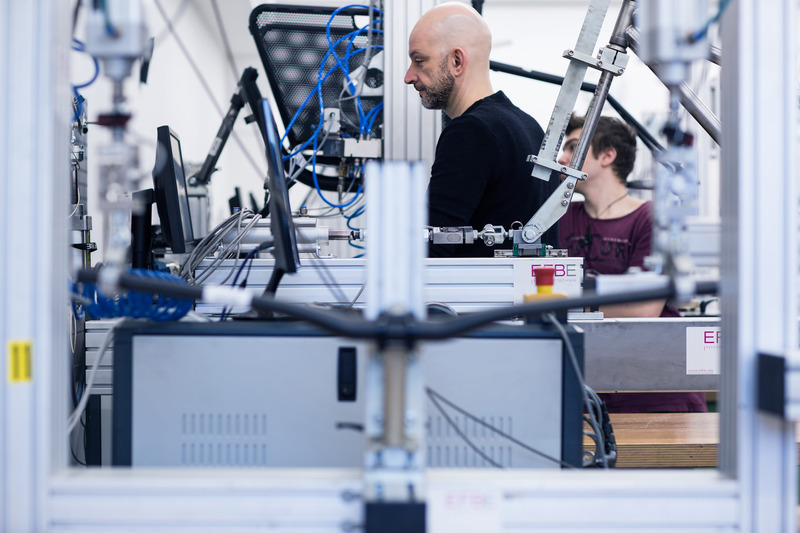 EFBE offer specific test programs and certification for, amongst others, XC, AM, Trail, Enduro and Downhill bikes – and also their e-bike variants. Operation on regular paved surface, wheels maintain ground contact at all times, no jumps/drops. Examples: Road bike, time trial and triathlon bike. Operation on paved, unpaved and gravel roads and trails with moderate grades. Wheels may occasionally lose ground contact, maximum height for jumps/drops: 15 cm. Examples: City, trekking, gravel, cyclocross and cargo bikes. Operation including conditions 1 and 2 as well as rough trails, rough unpaved roads, rough terrain and trails which require technical skills. Jumps and drops up to 60 cm. Examples: Cross-Country and Marathon MTB. Operation including conditions 1 to 3 as well as downhill grades on rough trails which require advanced technical riding skills, at speeds less than 40 km/h. Jumps and drops up to 120 cm. Examples: All-Mountain, Trail MTB. Operation including conditions 1 to 4 as well as extreme jumps, downhill rides at extreme grades and at speeds exceeding 40 km/h. Jumps and drops of more than 120 cm. Examples: Downhill, Freeride, Dirt MTB. Scalability of maximum total weight. The total weight in cycling increases due to trends like bikepacking, higher vehicle weights for e-bikes, but also demographic and anthropometric developments. The EFBE TRI-TEST® is scalable and can also reflect higher weights than the ones assumed in the existing standards. 1. Fatigue test. The time machine for materials. Fatigue damage is a particularly insidious problem because, under certain circumstances, fatigue fractures may only appear after years of use and can lead to sudden failure and potentially serious accidents. The EFBE fatigue test acts as a kind of time lapse and simulates years of usage within a short period of time. These tests investigate whether a component can withstand frequent intensive use over a long period of time. They therefore deliver important findings about material quality and dimensioning. 2. Maximum load test. Reality in the test laboratory. The EFBE test at maximum load ensures you are always on the safe side, even at maximum permissible load. For carbon materials in particular, but also high-tensile alloys, it is frequently the singular peak loads that are the decisive factor governing component failure – and serious consequential damage. We test the component under defined static load conditions and determine the permanent deformation. This is a key condition for certifying the safety of your product under normal usage conditions. 3. Overload test. The no-compromise strength test. What people do with their bikes nowadays often has nothing to do with how it was before. Think of downhill, gravity and dirt – then add E-MTB and other often fast-paced forms of mobility on two wheels. We investigate how much stress your parts can really cope with – and test whether a component can withstand short-term overload at critical limits without failing catastrophically. Ultimately, everything will fail – but it is more important that your product fails benignly, even under «conditions of foreseeable (mis)use». The decisive factor here is whether a crack, which can never be completely ruled out, becomes a warranty issue – or a case for your lawyer. 4. Stiffness test. What customers and testers want to know. 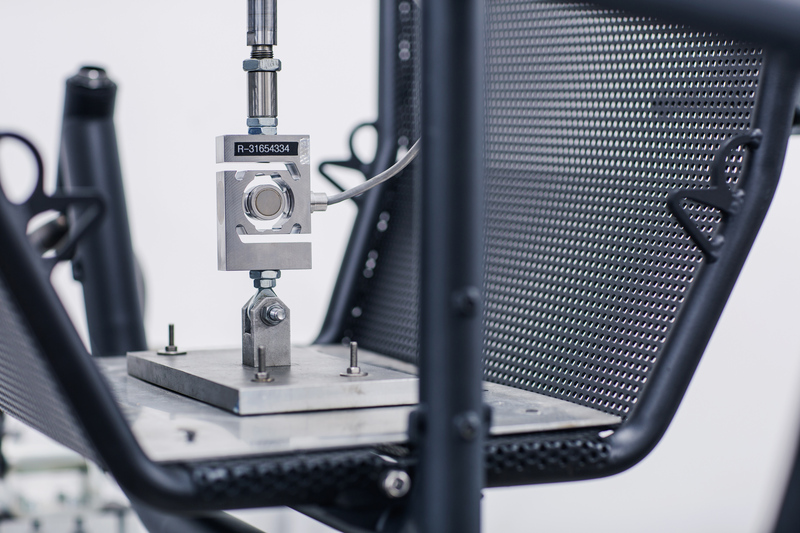 We test how much a component gives (flexes) elastically under load. We subject the component to a specified load and then determine its deformation. 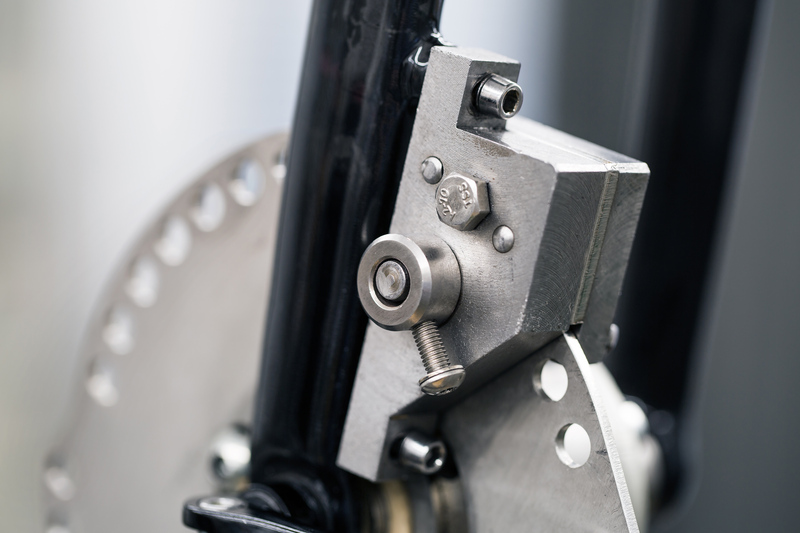 The results of non-destructive rigidity tests are regarded as an indicator of the stability and efficiency of a bicycle frame. They can uncover variations within models and detect damage to carbon components.